‘Swachhata hi seva hai’ said Itanagar local MLA Techi Kaso while addressing the volunteers of All Arunachal Pradesh Public Transport Federation (AAPPTF) here at IG Park this morning. Kaso in his address said that social service should be opt as a duty for all which should began right early morning. Parents need to guide their children as daily routine and should be binding to all local residents of colony/sector and town so that our locality and town remain clean and hygiene. Saying ‘cleanliness is next to godliness’ he said that we should remain in clean environment for which we have to maintain the cleanness drive weekly, monthly basis and need to encourage our younger generation, we need to discourage plastic which have high affect on land and water and also add to pollution and affect the environment. 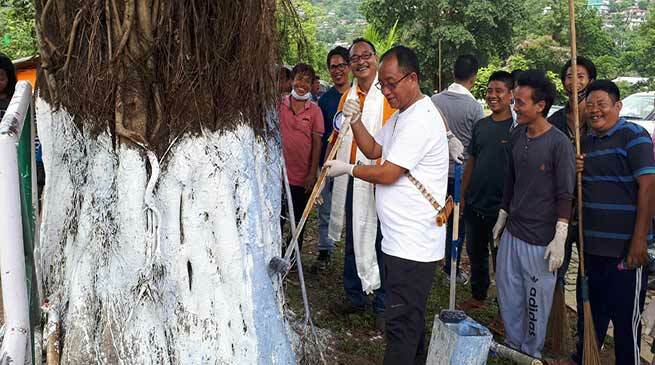 Itanagar ADC Incharge Hento Karga while lauded the volunteers and executive members of AAPPTF for such initiative which they have taken up for last few months and appeal all to join such drive in all sectors and colony of capital complex. He also assured the support of administration. AAPPTF President Dobing Sonam while in his address inform that social service encourage use to maintain cleanliness which held us remin fit and fine with disease free and sound mind. He said that such programme is being initiated by the organisation for last three month shall continue to do in future and sough support form all. He also appeal the drivers of commercial vehicle not to litter here and there and dispose their vehicle and other waste in dustbins located at various places on roadside of NH-415. Organising Chairman Tagio Sonam, IMC Executive Engineer Tadar Tarang among other also address the gathering and motivated the youths and volunteers on the occasion. The due elaborated several way and means of waste disposition and maintenance of cleanness in the area and capital complex. Executive members from all capital complex federal unit of the AAPPTF, Star Maxi Cab of Jullang, All Naharlagun Auto Welfare Association, Naharlagun-Yupia Tempo Union, All Naharlagun Tourist Taxi Union, Naharlagun Tata mobile welfare association, Naharlagun Carriage Tempo association, executive members of AAPPTF among others were present onn the occasion. The volunteers clean the bushes, broom the approach road and also take part in plantation programme, disposed off the garbage properly though IMC vehicle etc. IMC set the future road map for the Swachh Abhiyan.